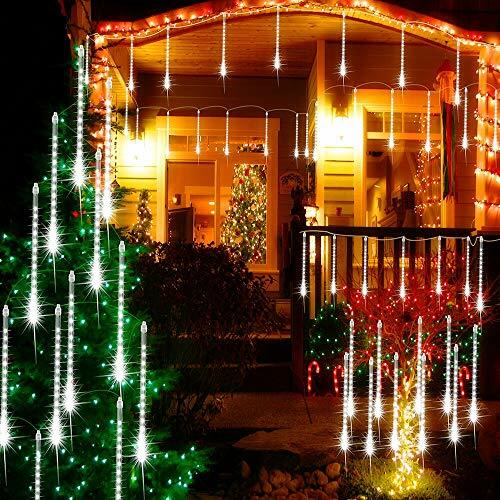 Perfect Choice for Holiday Decoration: BIG HOUSE snowfall led lights are percted for xmas decorations, New Year celebration, Wedding, Party, Valentine's Day, Business Celebration, Suit for Homes, Gardens, Lawns, Patios, Christmas Trees. High Quanlity and Energy Efficient: With the Acrylic transparent tube, which makes the string lights IP65 Waterproof, dustproof, corrosion resistant and cost resistant. And there are 14 SMD 2835 LEDs with 0.8W for each tube lamp to low power consumption and energy saving. Romantic Aesthetic Meteor Shower Effect: These tree lights will turn on and out one by one in sequence quickly of every light, it looks like falling snow in the sky. Gurantee: We strive to provide you with the best product and after-sale service, all emails will be replied within 24 hours, 30 days money back guarantee, 90 days replacement warranty and lifetime technical support are available.